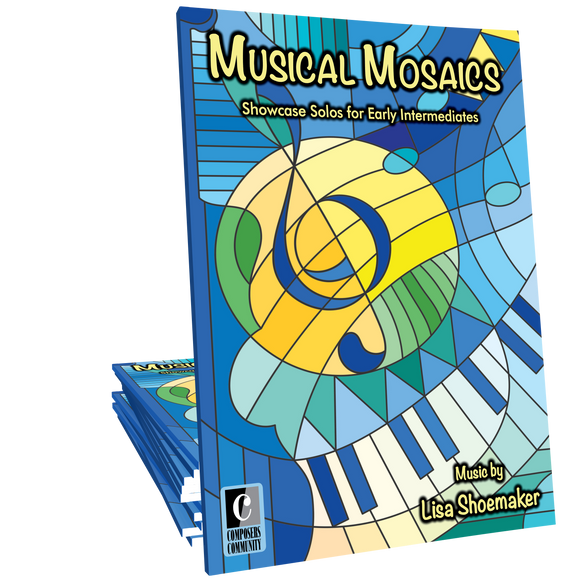 Musical Mosaics is a collection of ten showcase solos for early intermediates composed by Lisa Shoemaker. 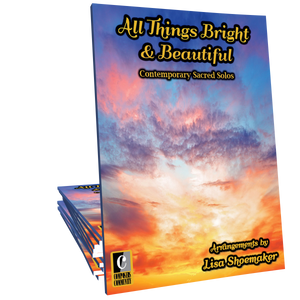 Covering a wide variety of genres and styles, these make for lovely selections for a recital or festival. You know it’s an amazing collection when your 13 year old student is listening to choose a recital piece and keeps saying, “I like this one, too!” Making a recital choice has never been so wonderfully difficult!!! Wow! I’m so happy I stumbled upon this collection. I’ll definitely be picking up the studio license to it. What a lovely collection! It’s modern and appeals to my intermediate students looking for something new & fresh! Wow, another great collection from CC. Several of these pieces were already favorites and there several more here that I think will be joining that list but I am most excited about Fright. Twinkly, approachable perfection. It is like Ms. Shoemaker knew exactly the piece I was looking for! I sat and listened to each and everyone of these amazing pieces which I rarely do. Each one is recital worthy! I couldn't stop listening. I love this collection and I know my students will too.